Leaf blister on maple? You say no way, leaf blister only gets on oak… A foliar disease that looks very much like anthracnose has appeared on area red maples in the last few days. 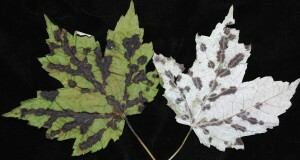 The disease is not anthracnose, but leaf blister of maple, which is caused by the fungus Taphrina carveri. The fungus overwinters in bud scales and attacks developing leaves early in the spring. Optimal conditions for the fungus are temperatures below 61ºF and periods of at least 12.5 hours of leaf wetness. (Sounds like much of the misty last few weeks!) When the conditions are right, infections progress rapidly covering most of the leaves in the canopy. 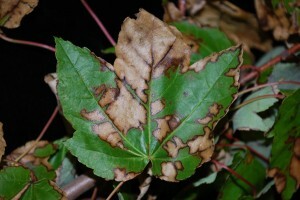 Once the leaves harden off and the weather warms and dries out, infection cycles wane. Symptoms of maple leaf blister include brown to- black, irregular-shaped, slightly-raised blisters on the leaves. 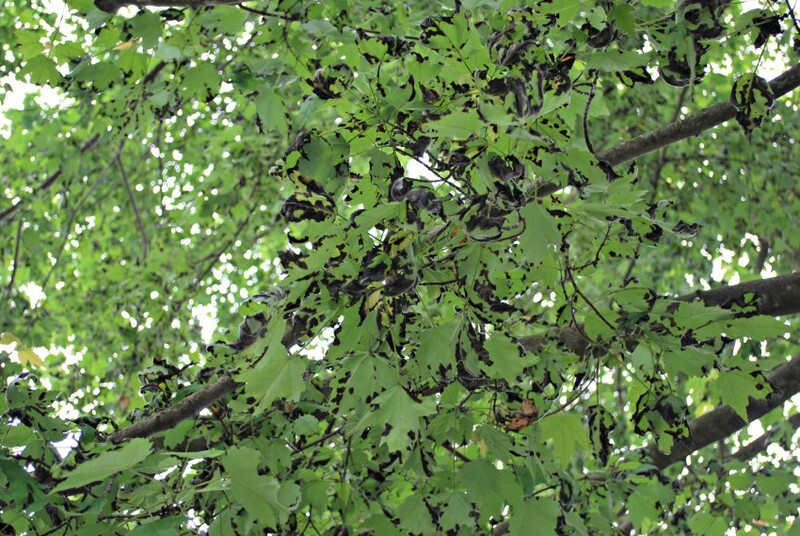 Multiple infections can cause the leaves to distort and serious outbreaks might cause some defoliation. 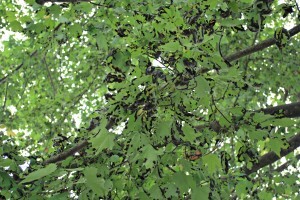 Defoliated trees will replace the lost leaves by mid-summer. Interestingly enough, blister is a crummy name for the disease because the leaf lesions are hardly blister-like. 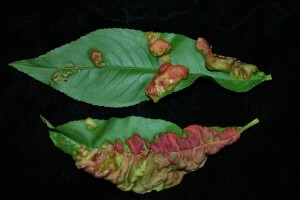 Another blister disease, peach leaf curl, caused by Taphrina deformans, causes dramatic leaf distortions. 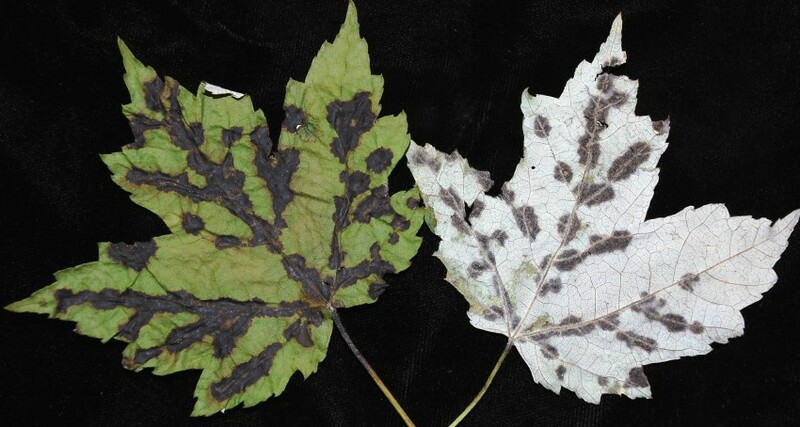 In fact, maple leaf blister looks and acts more like maple anthracnose than other leaf blister diseases. (I actually thought it was a scab when I first saw it – yup, there is a scab disease on maple too.) A quick and dirty field observation to separate anthracnose from leaf blister is that leaf blisters do not infect the leaf vein (vein appears healthy underneath) and will not work the petiole either. Be aware that it’s possible to find leaf blister and anthracnose on the same tree or even on the same leaf. Of course, microscopy reveals all, so don’t be afraid to send suspects to the laboratory to rule out anthracnose and any other diseases. Fungicides can prevent most foliar diseases in shade trees, but the treatments need to begin at budbreak, so there is nothing we can do at this point. And really, there is not much else to do – raking the leaves won’t help us – so just (here it comes) sit back and enjoy the view! Don’t worry, maple leaf blister will not kill the tree and may not show up again for several years. Enjoy it while you can!